This photograph shows the manager and nine players from the Kansas University baseball team. 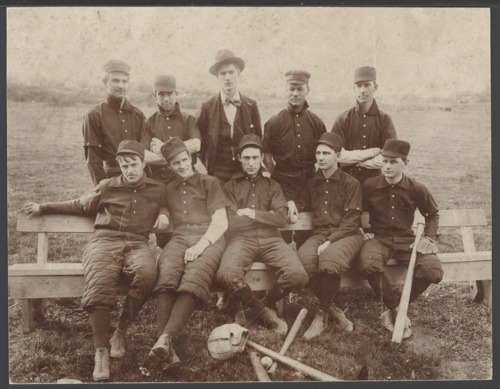 The photo includes Dale Gear (front row, second from the right), who lettered in baseball at KU in 1893, 1894, and 1895, and then became a professional baseball player. Gear was a pitcher and outfielder for several minor league teams and two major league teams--the Cleveland Spiders (1896) and the Washington Senators (1901). He also managed several minor league teams, including franchises in Topeka and Kansas City. After his playing and managing days were over, Gear served as president of three minor leagues, including the Southwestern League, the Western League, and the Western Association. Dale Gear was a Topeka businessman and was also a member of the Shawnee County Commission. The remaining individuals in the photograph are identified as follows: front row (l to r) - Laurence Chamberlain (of), Jim Kelsey (c), Mitchell (1b), Gear (p), Maurice Alden (2b); and, top row (l to r) - Ernie Agnew (3b), Lute Todd (ss), Hugh Means (mgr), Knott (c), Henry Wagner (p).